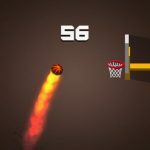 Basket Fall is a new endless dunking sim for mobile devices, which was developed by Kumobius. The game promises lots of characters, spring and magnet boosts, and challenging scenarios. Essentially, what you want to do here is to pull off trick shots and try to dunk the ball in the hoop, and as you’ll be doing this, you will have a chance to unlock some of the weirdest characters, balls, and themes out there. 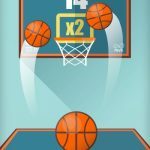 This is definitely an old-school-style endless dunking game where you can shoot the ball by tapping a piece of rope tied to the swinging basketball. There aren’t too many bells or whistles, but the challenge here, as you’ll see, is actually dunking the ball or pulling off a trick shot. So with that said, let’s move on to our compilation of Basket Fall tips and tricks that will come in handy as you try to complete more trick shots and dunks. Like in real basketball, aiming the ball and having a good shooting stroke doesn’t happen right away. But there are some fundamental things you should do to ensure yourself of a steady aim. For one, you should not tap when the ball is right above the net. Consider the physics of the swing when predicting the ball’s trajectory; look at the white shadow that appears when the rope swings and use that to help you in aiming properly. It may sound tricky, but with a little practice, you should get the hang of it eventually. Over time, you will get to unlock different types of balls, and not just basketballs. While all nets are of the same size, there may be some that look smaller or larger, and some balls may be better to use than others. It will all depend on your personal preference, but the retro bird and the baboon ball appear to work quite well for us. 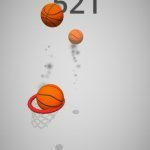 Your main goal in Basket Fall will eventually be to register as high a score as possible, whether you’re chasing your own high score or someone else’s. And you can watch your score go up big-time by scoring bonus points when the opportunity arises. The simplest way to get bonus points is to shoot the ball without any rim. Hitting a “ringless” shot, as they call it, gives you three bonus points. 4. Hitting Trick Shots – What Should You Do? It’s cool indeed to hit a shot without hitting the rim, but what about trick shots? By that we mean having the ball bounce off a wall and into the hoop. That is indeed a tall order, even for experienced players, but it does seem easier if the net is near a wall. And you can also try tapping as quickly as possible once you see the net, with hopes of the ball going in. Both techniques are quite complicated and would only give you two bonus points, so focus on the perfect shots if you’re seriously going for more points. These would be our hints for this endless dunking simulator. If you happen to know other tips for Basket Fall, don’t be shy to share them with us!